Named "the world's most popular artist" in 2015, it's not hard to see why Yayoi Kusama continues to dazzle contemporary art audiences globally. From her signature polka dots—"fabulous," she calls them—to her mirror-and-light Infinity Rooms, Kusama's multi-dimensional practice of making art elevates the experience of immersion. 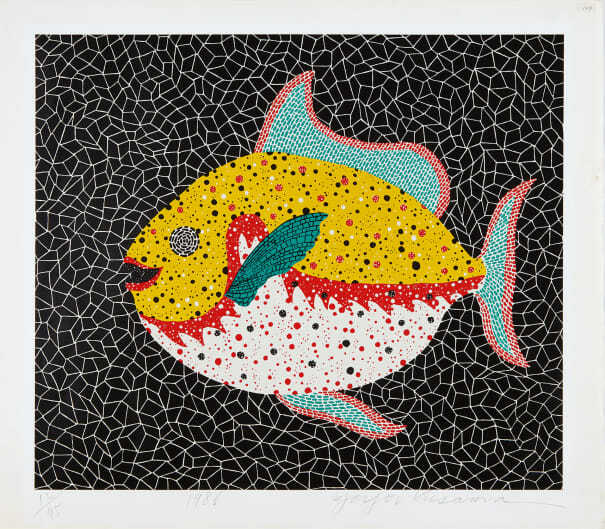 To neatly pin an artistic movement onto Kusama would be for naught: She melds and transcends the aesthetics and theories of many late twentieth century movements, including Pop Art and Minimalism, without ever taking a singular path. As an octogenarian who still lives—somewhat famously—in a psychiatric institution in Tokyo and steadfastly paints in her immaculate studio every day, Kusama honed her punchy cosmic style in New York City in the 1960s. During this period, she staged avant-garde happenings, which eventually thrust her onto the international stage with a series of groundbreaking exhibitions at the Museum of Modern Art in the 1980s and the 45th Venice Biennale in 1993. She continues to churn out paintings and installations at inspiring speed, exhibiting internationally in nearly every corner of the globe, and maintains a commanding presence on the primary market and at auction. Screenprint in colors, on Izumi paper, with full margins. Signed, dated and numbered 12/75 in pencil (there were also 8 artist's proofs), printed by Okabe Tokuzo, framed.